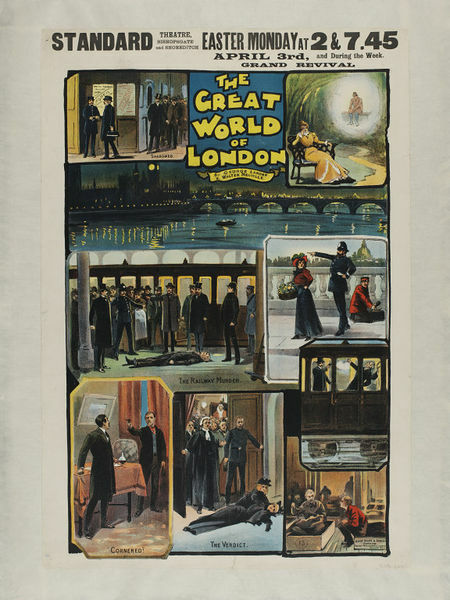 This talk will examine the role of posters in researching late nineteenth and early twentieth century melodrama. It will explain the importance of posters in selling the play, not only to the public but also to theatre managers who often would not accept it, if they did not like the posters. The depiction of spectacular scenes – battles, earthquakes, train crashes etc – was easier to depict on paper than on stage, and so cannot be considered to represent the production accurately. However, the posters are the best, and often the only representations which exist of less spectacular productions. The talk will compare the posters and the original scripts, and purport to show that the usually anonymous artists were surprisingly faithful to the dramatists’ intentions. Michael Diamond spent most of his professional life with BBC World Service. After retirement he wrote “Victorian Sensation” about the Victorian press and the Victorian public’s appetite for sensational news, and “Lesser Breeds” about popular literature 1890-1940 and its treatment of different racial groups. More recently he has continued to build up and research his unique collection of material about Victorian and Edwardian theatre and music hall. All lectures are free, no booking necessary.